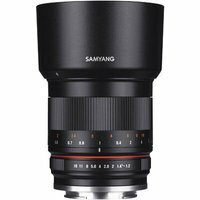 The Samyang 50mm F1.2 AS UMC CS is a manual focus lens for mirrorless cameras with APS-C sensor sizes. The lens features a bright f1.2 aperture with impressive bokeh and incorporates nine lenses in seven groups with two glass aspherical lenses (ASP) and Ultra Multi Coating (UMC) to deliver outstanding image quality. This lens is great for portraiture, travel and capturing the true atmosphere of a scene, even in dimly lit environments, without the need for flash or a tripod.